Revival plantation mansions...second only to the grand Oak Alley plantation in architectural merit." who built the first St. Louis Church and the first Ursuline Convent, both in the 1720's. 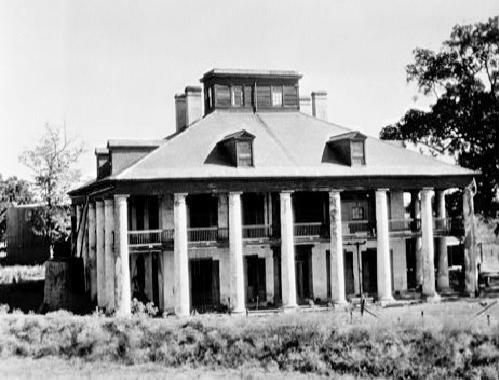 Seven Oaks, early 1930's; it was constructed in 1840.
wealthy sugar planter, Camille Zeringue, a descendant of one of New Orleans' first settlers. Company of the Indies to Monseigneur LeBlanc, French Minister of State, and associates. was contractor for the King's buildings and works in Louisiana at that time. that Camille had the Seven Oaks mansion constructed in 1840. "It is tragic that this fine house is being allowed to fall into decay." Side view, showing the plantation's cistern, ca. early 1930's. historic old home has gone from wreck to ruin. few years later. He very kindly shared the photos above and below, which he took in 1974.